Over 100 Pasadena residents are clutching their guts today, the victims of a recent outbreak of food poisoning. 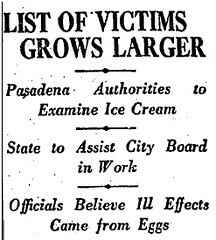 Those affected had all eaten a batch of tainted French vanilla ice cream sold by a local catering company. At first, the toxins were suspected to have come from the copper mixing vats used by the unnamed company; however, after questioning some of its employees, City Bacteriologist C.W. Arthur and City Chemist Frank Marks (how ’bout those job titles!) uncovered the true culprit. It seems that the ice cream recipe called for an egg mixture which the company only bothered to make about once a week. Unfortunately, the ice cream was frequently made several days later. Arthur and Marks found that a scoop of the toxic French vanilla contained about 20 times as much bacteria as a sample of raw sewage. Oh, careless confectioner, what have you wrought!